Ultra 3X ETF’s beat individual stocks again! 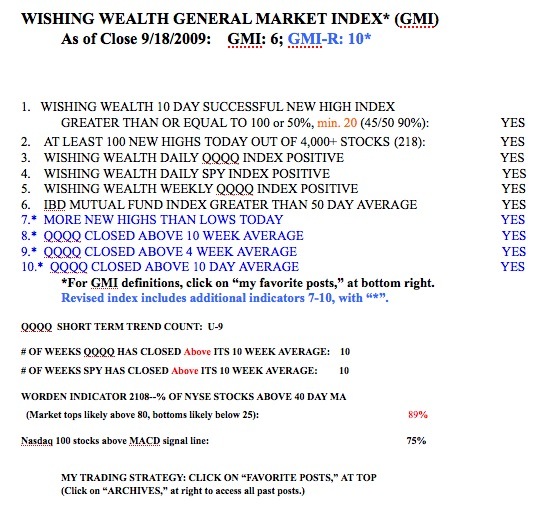 GMI and GMI-R at the max; short and long term indicators in up-trends; GMCR toppy? The ultra ETFs do seem to be really great to hold during a rally like we’ve had the past couple months. I find them to be really hard to manage with stop losses, though, because they can go on such large swings. How do you manage to not get shaken out of the 2x and 3x ETFs when the indexes dip 4-7% and then rise again? I buy a small amount off of support and average up. Sell triggers are below support. (Triggers reside on the broker’s computer until the price is hit, after which the sell order is relayed to the exchange as a market order. In this way the market maker does not see my stop loss point in advance and take it out.) A rising ETF rarely breaks my support area. If it does, I am out. The key is to have definitions of support that work for that ETF. You kept saying the benefit of 2X/3X ETF while researching individual growth stock. Is this just an old habit before the inception of 2X/3X ETF, or you really see the benefit of individual growth stock? More specifically, how do you think about Darvas’ method against 2X ETF? A while ago I remember you had an article on the stock price change over Davas’ period, and it was a big bull market. If there were 2X ETF at that time, was Davas’ method still superior? What definitions of support do you use for QLD? Looking at the QLD chart, it seems like when QLD dipped and offered a good price to get in, that was the same time that IBD says the uptrend is under pressure or in a correction after the indexes dropped (like 8/17 to 8/20 and 9/1 to 9/9). The GMI also showed a down trend starting 9/2 which looked to be the bottom of the last QLD dip. By the time the market indicators are positive again, QLD looks extended. what will you teach in your next class if you have abandoned individual stocks for 2x and 3x etfs? just how to use stop losses and TA on the market? Do you have anymore screens for individual stocks? I have had the same problem as Shawn M. Each time QLD builds any significant support it is during a substantial correction. This corection started on 8/31 and bottomed on 9/3. In your posts you talked about still being in cash and on the sideline on 9/8. This is very similar to myself. But how and when did you get back in QLD after 9/8 without taking significant risks. I like Shawn M have not come up with a method to do this successfully. Any help would sure be appreciated. Examples of past entries would be very helpful. I am also curious what you use for entries and exits on these ETFs. Any help would be appreciated. I enjoy your blog! My primary strategy for timing short term buys and sells is to look for daily moving averages that the ETF tends to find support at. Once I find the right daily moving average, I wait for the bounce, and buy. I then place a stop loss below the low of the day of the bounce. I only buy if the WEEKLY averages are also in an up-trend. I will provide some examples in a future post.